I have long wanted to knit a William Morris design, but have yet to find a pattern. This “K” is my first, embryonic attempt to pay homage to Morris through a knitting pattern, and of course, I’ve done it in Fair Isle (of course, because Fair Isle is my preferred knitting “medium” and of course, because I have more colors of Shetland yarn than any other weight in my stash; they’re my tubes of ink). Rather than taking inspiration from one of his many sumptuous designs from natural sources, I’m using this letter as a way to explore Morris’s typographic design ideas. I’m not sure where this is going to lead me, so it’s just a sketch for now. 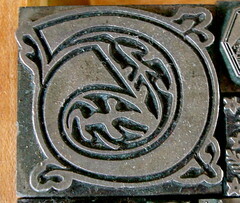 It is based on one of the Kelmscott Press marks (right), which appeared in his own work, Well at the World’s End (1896). 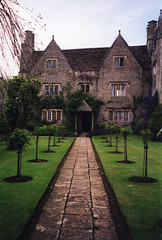 Kelmscott is the location (on the Thames) of the 15th- century manor house (left) in Oxfordshire that William Morris lived in from 1871 until his death in 1896. It is now a historic house museum and open to the public. The home of the Kelmscott Press was in Hammersmith, but Kelmscott was a center of artistic production and creative energy for the 25 years Morris lived there and hosted many of the literary and artistic luminaries of his day. 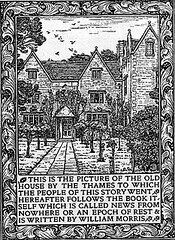 Morris featured his Kelmscott home as the frontispiece to his Utopian novel, News from Nowhere, 1893. That wood engraving (by C. H. Gere), is pictured above, at right. Morris imagined Kelmscott as a center of craftsmanship where artisans would congregate and produce artistic creations not for money, but for joy. The text and many images of News from Nowhere have been digitized and made available by the University of Iowa Libraries’ Morris Online Edition. Morris delved into the world of letterpress printing in 1891, well into his spectacular career, and just five years before his death. He named his press after his home, and it proved to be one of the most successful of his many businesses, and certainly one of his most celebrated accomplishments. 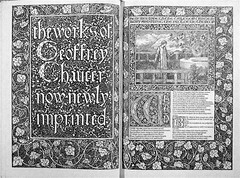 The sine qua non of the press was the richly–decorated edition of Chaucer’s works, illustrated by Edward Burne-Jones in a series of 87 wood engravings. In addition to printing a number of exquisite books, the Kelmscott Press became known for its typography. 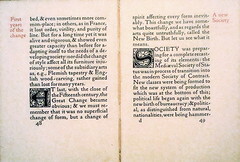 Morris and his unofficial partner, Sir Emery Walker, studied the very early typefaces of the fifteenth century, and produced three seminal typefaces: Golden (designed for a re-print of William Caxton’s 1483 edition of The Golden Legend), Troy (named for the Press’s edition of The Recuyell of the Historyes of Troye, also a Caxton re-print), and Chaucer. 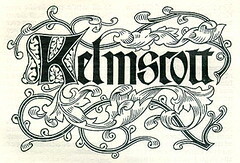 Several Kelmscott fonts are available in electronic form (see below). Chaucer and Troy are basically the same font, but in different sizes. ORRIS also took great pains to create elaborate initials (usually wood engravings), a demonstration of his interest in medieval craftsmanship. Just as early printers added initials to mimic manuscript initial letters, Morris liked to set off the first letter of the first word of a chapter or verse with a decorated initial. Some of these have been collected and are available electronically. 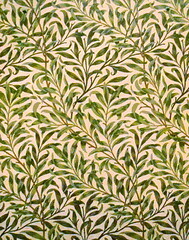 Morris commissioned highly-skilled paper makers to create (by hand, of course) lush, white papers for Kelmscott books. Likewise, he looked all over Europe for the most precisely-hued black ink. [Note: the “M” pictured above is Jenson Initials No. 79 (American Type Foundry Specimen Book, 1912) The type design is based on Morris’s work, which is in turn based on the typography of Nicolas Jenson]. Before he became a fine press printer, William Morris was intensely productive in textile design. He not only created designs, he taught himself techniques for weaving carpets and upholstery, making embroideries, and most famously, dyeing. Edward Burne-Jones made a cartoon of Morris demonstrating weaving techniques (right) in 1888. It is said that Morris was so intent upon learning the secret of indigo dye (blue was evidently his favorite color) that he immersed himself—literally—in blue dye for two years. He delivered a memorable lecture, “The Art of Dyeing” in Edinburgh in 1889 (text here, courtesy of the Marxist Internet Archive). With all his interest in textile design and fabrication, it seems extraordinary that he never appears to have had any interest in knitting, except as a conveniently evocative verb. I imagine that is because in the late-ninteenth century, knitting was considered a homecraft, something associated not with art but with functionality. Fishermen and fishing communities in Britain produced sweaters; most women learned to knit stockings; but the days of guild-produced, fine knitting were centuries distant and had left little imprint that might attract Morris’s attention. I assume he simply never considered knitting artisanal. Because I wanted to concentrate on Morris’s printing, rather than his wallpaper or upholstery designs, I chose colors that reflected what might appear in print: creamy whites for the beautiful, handmade Kelmscott papers, red ink for the rubrication found throughout the Kelmscott Chaucer, and a dark, almost-black because although Kelmscott black inks were legendary, I try to avoid flat black in wool (I find it deadens other colors around it). Morris wallpapers and chintzes almost always have a much wider range of colors, which I would like to explore further. Dreyfus, John. 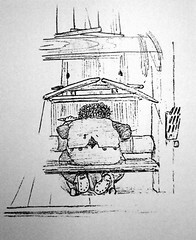 Morris and the Printed Book, A Reconsideration of his Views on Type and Book Design in the Light of Later Computer-aided Techniques (London: William Morris Society, 1989). Parry, Linda, ed. William Morris (London: Victoria & Albert Museum, 1996). Peterson, William S. The Kelmscott Press : a History of William Morris’s Typographical Adventure (University of California Press, 1991). Thompson, Paul. 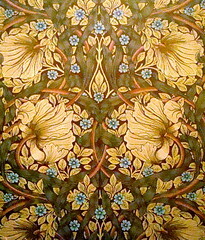 The Work of William Morris 3rd ed. (Oxford & New York: Oxford University Press, 1991). 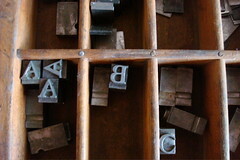 Jenson Initials (Dale Guild Type Foundry)—like Morris’s work, these initials were inspired by Nicolas Jenson’s designs—in metal type, not electronic! Jenson, No. 58, also by Ted Staunton (based on Golden Type, in turn based on Jenson’s typography, ca. 1470). I so enjoy visiting your blog. Your knitting letters are beautiful. you kept me awake in the night, looking at typo!!! And you have me musing again about how to do those beautiful flowing lines in knitting. 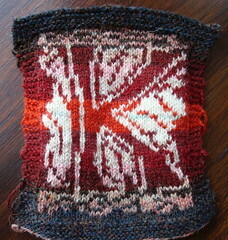 Intarsia is just too jagged, unless you're going to do an insanely small gauge. Travelling cables, perhaps.. but I still haven't figured out the geometry for oblique rises (like 8 stitches over and one row up). Thanks! Maybe we can feed questions to the collective consciousness and hear the echo of an idea in reply. Gorgeous, and a informational resource too! 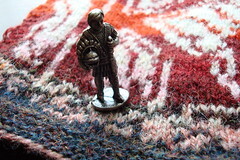 Knitting has always been looked down upon, that's why Morris ignored it. I'm sure he had a mother or grandma at home cranking out some beautiful things and subtly influencing him. Just found your lovely blog and your abcdarium inspired me to comment. I am an attorney and recently helped draft a brief regarding state constitutional issues and in researching the documents surrounding the adoption of the constitution in the 1870s, we found and used a quote incorporating an older term meaning grammar school student -- abcdarian -- now the preferred term in our office. It is a shame that we have left behind some very descriptive terms. Super awesome . . . some of your links are doing that weird blogger thing where http://www.blogger.com goes before the actual one, just so you know. Anyhow, beginning knitter here, but your blog looks super awesome. Thanks so much, everyone! I'm glad you're enjoying the ramblings. I'll work on getting those links fixed & on putting together "L."
I am learning a ton - and I consider myself quite well read in knitterly things and beyond. THANKS! Her work reminds me of your Fair Isle lettering. The March 7 post, in particular, may intrigue. I was led to your blog by a route I can't remember but I'm so glad I found it. What beautiful work you do, and what a scholar you are. I am not worth to be a blogger, I can see that. Of course I'm just a beginner (my blog is about a week old) but still.. what a high standard you set! Thanks for this post, it was illuminating. Absolutely beautiful. I love Morris. Have you read his poetry?